To design a strategic corporate identity for a greeting card distributor that provides communication services to prisons and inmates. Contemporary Greetings is a 501(c) 3 non-profit organization with the sole purpose of providing writing materials to men and women incarcerated long-term in state and federal prisons. This logo and point of purchase material needed to create a clean and refreshing look that would stand out in a dark and dreary environment. In an industry that is historically institutional with minimal emphasis on quality or customer service, Contemporary Greetings wanted to provide a better product and better service to the inmates. Ready to take on the daunting mission of helping inmates connect with their loved ones, they wanted to develop their brand to make a difference in the lives of inmates. 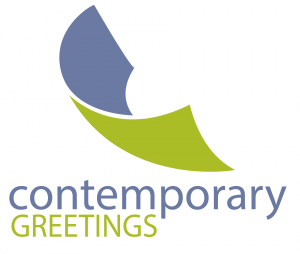 Use a folded greeting card shape to form the ‘C’ in Contemporary and float above the name creating a hopeful and ‘freeing’ feel. Bright colors and a light font treatment provided the uplifting design needed to brighten the corner of the prison commissary. Knowing that at least once during their day, inmates can be met with something bright and hopeful.